time with God | God's Abundant Blessings! WEATHER: I don’t have to tell most of you that this country is in an extreme heat and drought situation. Living in farm country, every day the news tells us how much damage the crops are suffering because of the lack of rain. It’s easy for the untrained eye to see it as the corn stalks wither and brown in the heat. Farmers struggle to keep their hogs cooled. Gardeners usually fight Japanese Beetles this time of year are also struggling to keep their gardens watered sufficiently. It’s not “fun” to be outside, especially in the sun. And at night we can’t even enjoy a fire either because of the heat or the burn ban restrictions. When a cloud appears in the sky or there is the slightest breeze or drop in temperature our hopes soar that rain and cooler weather are coming. NEWS: It’s very discouraging to listen to the news these days from two innocent girls missing in Iowa to the inexplicable shootings in Colorado, suicide bombers, robberies, life-altering illnesses – the list continues. We look for any glimmer of hope in the tragedies. David was in a similar situation when he as in the wilderness of Judah. He was feeling totally drained and L-O-N-G-E-D for God’s presence. David lived a life being hunted by the king, hiding in the desert and not being able to go to the Temple to worship God. Psalm 63 describes some of that longing. David remembers that he has seen God in the sanctuary and gazed upon God’s power and glory. He praises God for His unfailing love and care. Have you ever been in a spiritual wasteland where you are struggling for nourishment? I have. Following my husband’s heart procedure and other issues, I felt drained. I KNEW God was there caring for me and even carrying me through the tough times, but I couldn’t FEEL Him. Somehow the inner assurance seemed to have evaporated in the heat of trials. After I wrote Practice! Practice! Practice! a dear friend reminded me of a simple book that I hadn’t looked at for a while – Invitation to Solitude and Silence, by Ruth Haley Barton. I picked it up again and have been enjoying my morning time with God just BEING in His presence. There is such a blessing that occurs from spending time with God – not on the fly as our guest pastor said Sunday; praying on the go, listening to Christian music, quickly reading a 2 minute devotional – all of which are good. But there is an importance of being thoroughly drenched and refreshed by BEING in God’s presence. Whether it is simply picking up His word and reading a verse or a portion of scripture and then just sitting there, thinking about it, thanking God for His word, listening to what He might have to say. 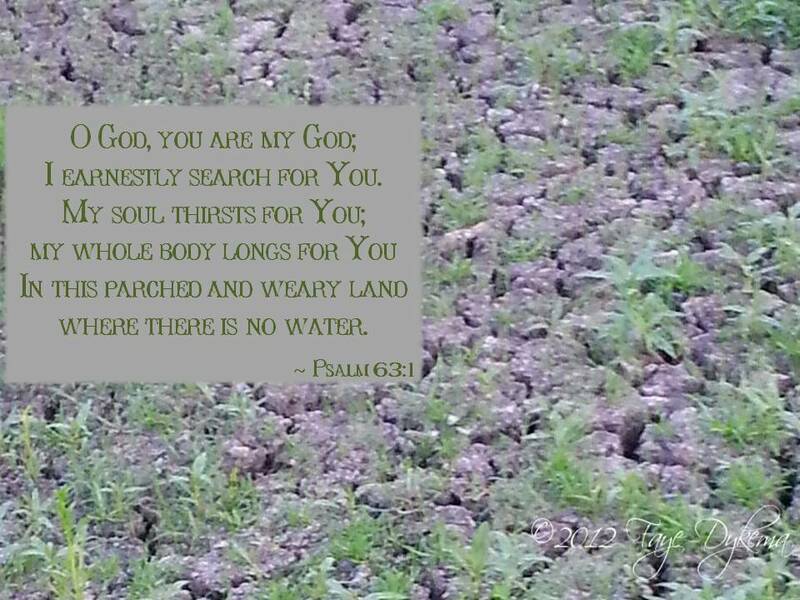 As much as we are physically craving rain to water the earth these days, how much more should we be thirsting, longing, craving for God to fill us spiritually? I want to encourage you – and myself – to spend that much needed time IN God’s word, WITH Him – just BEING in His presence and letting Him minister to your needs. It’s not easy and it’s not just sitting there. It is actively waiting and listening for what God will place on your heart. Watch, pray. It’s incredible how God blesses, not only in those moments, but continues to shower you with His love, grace and care in the hours and days following your time with Him. I am linked with Good Morning God and Beholding Glory.